Last day of 4th Grade! We have now officially finished the school year. 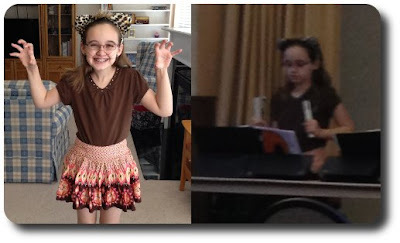 The report card has been issued, and Amber has been promoted to 5th grade. We've actually completed our first semester of homeschooling. It was a resounding success that has allowed for a marked difference in our daughter. Others have commented on the remarkable change in Amber. Even my hair stylist (who is also Amber's) has noticed. This past week was a pretty easy final week of school since the majority of the subjects finished last week. However, the week was anything but dull. We have been non-stop go and thankful that there wasn't much school book work to be done. There have been so many fun and exciting events this week. I'll just share a bit about each one. Amber had a chimes choir performance at the Lutheran Senior home. The children played several pieces of music, including one that was a bit of a play. It was called "The Lions and Their Denner Guests". All the children dressed up like lion cubs to help tell the store of Daniel in the Lions Den through words and music. The last Girl Scout meeting of the year also happened on a triple booked day this week. 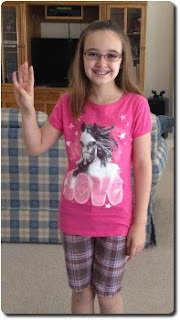 Amber really enjoys going and is excited to start her second year as a Junior Girl Scout. They have lots of fun things planned for the summer and next year. 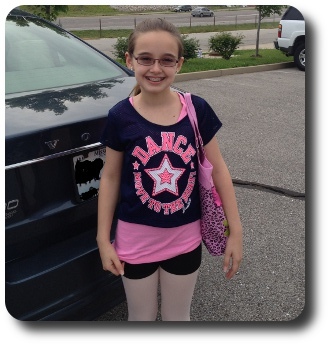 There was also Amber's final ballet, lyrical, jazz and tap dance classes of the semester. Recital is TOMORROW! Lots of excitement over her first recital with this dance studio. The final rehearsal was tonight and the anticipation is high. It will be good to have a dance breather for a couple of weeks before summer dance starts. Tuesday we made the 12 minute drive to THE STORE! Yes, the brand new American Girl store that was built 12 minutes from our house. Amber had been desperate to go, but I was unwilling to fight all the other midwest Mommys and their desperate children. Monday afternoon I decided that it was nearly the best we were going to get crowd-wise for the store. The local public and private schools would be out soon and it was now or never. We went to bed on time Monday so that and we could be there Tuesday as the store opened. I was later informed by Amber that "today was just such a fun and wonderful day". We were only at the store 2.5 hours, and that included lunch in the Bistro. Overall it wasn't a huge purchase day either. A few doll accessories, a kitty friend for the dolls, matching doll and Amber shirt and a single doll outfit. The chosen doll of the day did get her hair styled and ears pierced. We had a fun time at the store, but nothing like the experience we had in Chicago. Our local American Girl store is more store than entertainment. Knowing that nothing could top the American Girl store, I still forged ahead with the rest of the plans for the week. 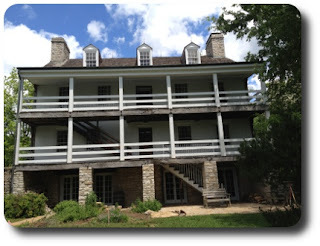 We took a field trip on another day to the Daniel Boone Home & Boonesfield Village. Quick poll. How many of you knew that Missouri had anything to do with Daniel Boone? No fair anyone who lives in Boone County or Boonesville, MO. No cheating if you live by Booneslick Rd, shop off of Boone's Crossing or cross the Boone Bridge over the Missouri River every day on your way to work. Daniel Boone actually retired to Missouri in 1799 at the age of 65, bringing his wife and 5 of his adult children. He didn't die until 1820, in the home that we visited. He did a lot of survey work in Missouri, even after retiring. The house is a beautiful 4 story(!!!) Georgian house. It is a mansion compared to other houses of the time and remarkably preserved and restored. Mostly just preserved. It was actually the house of Daniel's son, Nathan and his wife. However, Daniel & wife, Rebecca, lived nearby. Eventually the elder Boones moved in with Nathan and family. Daniel actually helped his son build the house we saw. 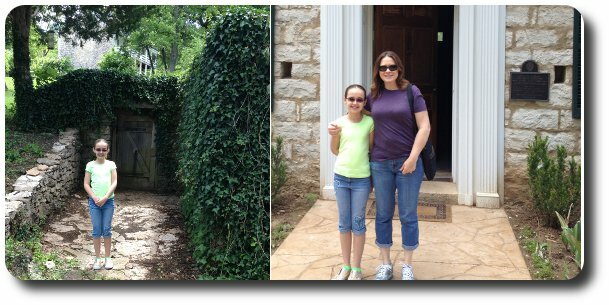 On the grounds there is also the house of one of Daniel's daughters. It is another lovely home and oversized for the time. 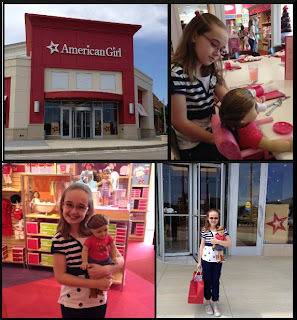 Amber had so much fun on this field trip and said it was "as much fun as the American Girl store, just different fun". You can't ask much more than that of a field trip. Left: Amber found the refrigeration house before the tour. She knew exactly what it was used for. Right: Amber & me at the Back entrance to the house. Notice the gun ports on either side of the door. They to defend themselves against Indian attack. The rest of our week also included play time with one set of grandparents and visiting the other set. It's been an absolutely joyous and busy week. There was a point a few weeks ago when I realized how busy this week was shaping up to be that I dreaded it. Last weekend I was still terribly dreading our schedule and was praying for patience for this week. I don't know that I needed that much patience, I think I asked for the wrong thing. What I did receive, and needed, was an attitude adjustment. These were not things that we needed to simply get through. This was a wonderful week of excitement and living. It may have been busy, but every one of the events was a positive experience. I was reminded of the school year theme when Amber was in first grade - Joy in the Journey. I needed to find the joy in the journey of this week and allow Amber to as well, instead of worry about the frantic schedule. Because of this change in my attitude we have had the most enjoyable, pleasant, and happy week in a long time. What I have gained from this week is a new attitude toward everything that we do. We need to find Joy in our Journey each and every day and not let the little things get to us. Have a great weekend and Mother's Day everyone! Christy ~ I am so glad the first semester went so well for Amber. It sounds like you have seen the true benefits of homeschooling!!! I hope the dance weekend goes well! Thanks so much for linking. I'm glad to have made a new friend in you . Amber did go nuts at the Chicago store. The trip there, and to other stores on the Magnificent Mile, was her 9th birthday present. The AG store in St. Louis is just a bonus for us now. I've enjoyed reading your blog as well, and it's been great to meet and make new friends with such wonderful people in the homeschooling community. Sounds like a wonderful week! Sometimes it's hard to just relax and go with the flow, isn't it? I occasionally, in the busier weeks, find myself thinking of that poem (can't remember the author) with the line "Everything I do, I rush through, so I can get to something else." Exactly! I feel sometimes like I'm rushing through things to get to something better, but what could be better than what I am already doing? Amber is dawdling while preparing for dance recital right now, and I'm trying my best to remember there is joy in this part too. Some day she won't be my little dancer girl, and a little dawdling is just part of her personality. Welcome to 5th grade! Whoop! Looks like you had a wonderful last week of 4th grade! My girl would LOVE to see AG, but it's 3 hours? or so away from us. Perhaps some trip! So wonderful to see such a great change in Amber. We had a similar experience with my youngest girl coming home. What a joy to behold. Congrats on finishing up your year. We still have a couple weeks left before we officially take a break for a bit. We live about the same distance from the American Girl store at the Mall of America. We've been in to browse a couple times but we've never done the "full" experience of eating at the Bistro. Maybe some day! We went to the mall this week to go to the aquarium, and it was hard to say "no" to the AG store for her and "no" to the Lego store (all the kids wanted to go in there)...but we had such a busy day already I knew we would never get it all done if we got sidetracked into those stores too! Luckily we do live close by so it is easy to tell the kids we really can come back another day!